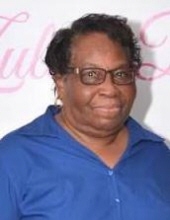 On Wednesday, October 24, 2018, Victoria Young Junious, widow of the late Benjamin Tillman Junious, departed our midst at the Four Seasons Nursing Home & Rehabilitation Center in Brooklyn, NY. Born on August 2, 1944, in Clarendon County, she was a daughter of the late Maggie White Lawson. Service of remembrance shall take place on Saturday, November 3, 2018, @ 12:00 noon from the St. Phillip R.U.M.E. Church, 4574 Old River Rd., Pinewood, where the Pastor, the Rev. Powell Hampton, shall preside. Words of victory shall come from Senior Pastor Mechelle Leak of the Lighthouse Pentecostal Church, Ft. Washington, MD. The service of committal shall following in the family plot of the St. Phillip R. U. M. E. Church Cemetery. To send flowers or a remembrance gift to the family of Victoria Young Junious, please visit our Tribute Store. "Email Address" would like to share the life celebration of Victoria Young Junious. Click on the "link" to go to share a favorite memory or leave a condolence message for the family.